USS PINTADO was one of the STURGEON - class attack submarines and the second ship in the Navy to bear the name. Both decommissioned and stricken from the Navy list on February 26, 1998, the PINTADO subsequently the Navy's Nuclear Powered Ship and Submarine Recycling Program at the Puget Sound Naval Shipyard at Bremerton, Wash. Recycling of the submarine was finished on October 27, 1998. This section contains the names of sailors who served aboard USS PINTADO. It is no official listing but contains the names of sailors who submitted their information. 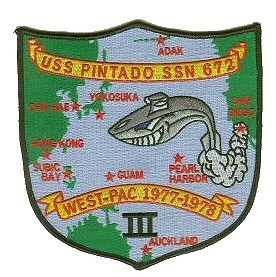 Click here to see which USS PINTADO memorabilia are currently for sale on ebay. May 1974 off Petropavlovsk, Soviet Union USS PINTADO reportedly collides almost head-on with a Soviet YANKEE - class nuclear-powered ballistic missile submarine while cruising 200 feet deep in the approaches to the Petropavlovsk naval base on the Kamchatka Peninsula.The Soviet submarine surfaced immediately, but the extent of damage was not known. The PINTADO departed from the area at top underwater speed and proceeded to Guam where it entered drydock for repairs lasting seven weeks.The collision smashed much of PINTADO's detection sonar, a starboard side torpedo hatch was jammed shut and a diving plane received moderate damage. The PINTADO was on an intelligence gathering mission in Soviet territorial waters. December 6, 1977 off Korea USS PINTADO suffers damage to the top of her rudder in a minor collision with a South Korean Navy ship during an exercise. The PINTADO initiated emergency deep dive procedures when the surface ship turned toward PINTADO at close range.